This well presented 2 bedroom, 2 bathroom apartment for sale in Peyia is close to a wide range of local amenities nearby and Coral Bay, known for it’s sandy beaches and crystal clear waters, is only a few minute’s drive away. 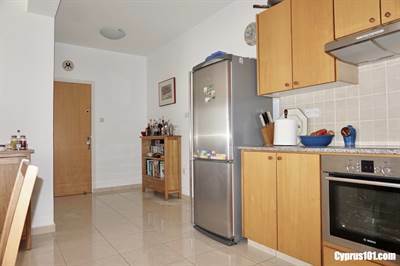 The property is spacious throughout with good quality finishes. The accommodation features an open plan living area with comfortable lounge, dining area and well equipped kitchen. Sliding patio doors provide easy access from the living area to a good size covered balcony with stunning mountain views. Through an archway off the living area, a hallway leads to two double size bedrooms with fitted wardrobes, shower room and family size bathroom. The property also benefits from a large storage room located on the ground floor and an allocated parking space. The complex has an impressive variety of facilities including communal swimming pool with central arched bridge, outdoor pool showers, community room with table tennis table, seating and kitchen facilities, squash court, sauna, indoor showers and changing rooms, full size gym, bowling green and beautifully landscaped gardens. The management committee is made up exclusively of apartment owners and the communal fees can be paid monthly, quarterly or annually. A contingency fund covers additional works needed periodically, such as external painting. The property is ideal as a holiday retreat and/or rental investment, is tastefully furnished and has full title deeds.